Katie Smith always had a plan for her life after a stellar college basketball career at Ohio State. Whether it was following through on her initial intention to become a dentist or her current aspiration to be a registered dietician, the 5-11 guard didn't want basketball to be the only option in life. But her prowess on the basketball court prompted her to put off plans for dental school. "Basketball just took off and kept going," said Smith, 39. Smith has no regrets about her decision to stay with basketball and with good reason. She's garnered a lifetime's worth of individual and team honors. A two-time WNBA champion with the Detroit Shock and three-time Olympic gold medalist, Smith is the all-time leading scorer in American women's professional basketball history, having scored 7,848 points in two years with the now-defunct ABL and 14-plus seasons in the WNBA. The oldest player in the league, Smith is currently second on the WNBA's career scoring list with 6,415 points, trailing Seattle Storm forward Tina Thompson. As of Thompson's last game on Aug. 31, she has scored 7,433 points. "It means I've been consistent for a long period of time and I've been able to do my part and compete at the highest level with anybody," Smith said. "That means a lot to me." This will be the last run for Smith, who plans to retire at the end of the season. She'll miss playing but is ready for the second part of her life. "I do want to coach, whether it's in the WNBA or college," Smith said. "I'm going to finish my graduate degree and become a registered dietician." Earning that Master's degree is important to Smith, who wanted to have options when she retired. "Over the last few years I was wondering what I wanted to do," she said. "I think I realized I wanted to coach, but I didn't want that to be the only thing that I knew." But until the final whistle of her playing career, the only thing on Smith's mind is helping the Liberty make the playoffs. The Liberty (11-19) enter Friday's game against the Atlanta Dream 2 1/2 games behind the Indiana Fever (13-16) for the last Eastern Conference playoff spot. The Liberty has four games left, the Fever five. "This is our season," Smith said. "And it's going to be a dog fight between Indiana and ourselves in the East." Smith never thought she'd be starting for a team this year. Having a key role coming off the bench was the plan for her until a season-ending injury to veteran guard Essence Carson four games in thrust her into a starting role. 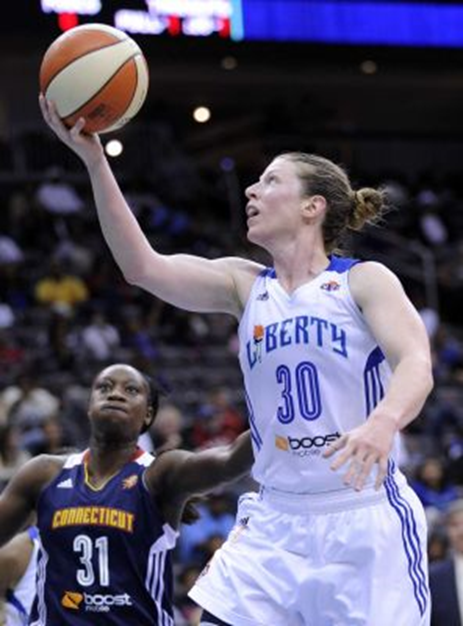 Smith's influence on her Liberty teammates has been positive, especially the rookies. She's often seen speaking with them after games. "She forces us to pay attention to the details, the little things," rookie forward Kelsey Bone said. "Coming into the league she's helping us understand the small things and how the game works." Said Smith: "Some days it's good starting and some days it's not. You wish Essence was out there, getting up and down the court, so you can come in and give her a break. But this is where we're at now and I'm going to give it my all."